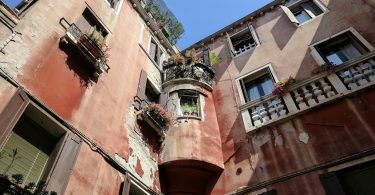 Venice is an island, and if you’re in relatively good shape, you can walk the whole thing. 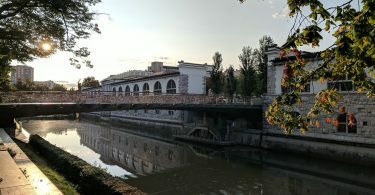 But if you had a bit too much pizza and wine (not speaking from experience AT ALL), you might feel lazy, and want to take some public transport back to your hotel to sleep it off. Enter the Vaporetto! Venice sees an astronomical 20 MILLION visitors each year and this incredible city has figured out public transport. 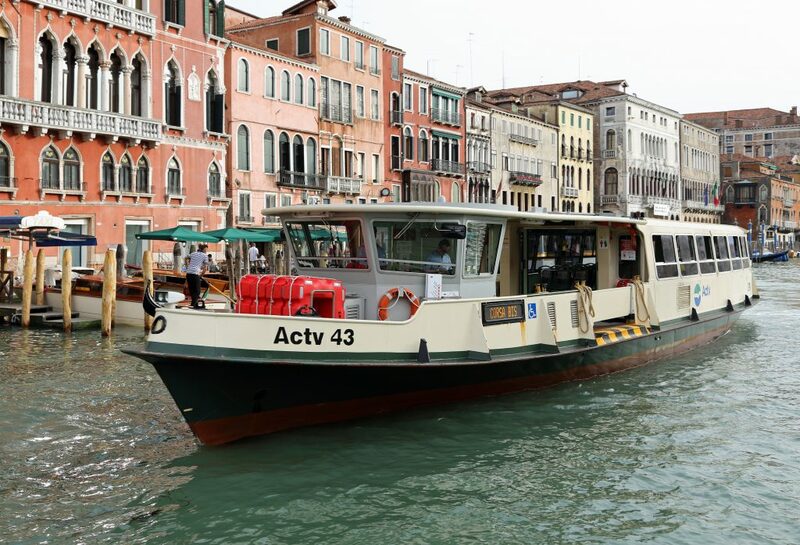 The vaporetti are a fleet of “water buses” that work much like a typical bus or metro stop would. Just like a metro station, they have lines with various stops around the city. The stops are easy to find as they’re along major canals, and are marked by yellow floating platforms. They also run round-the-clock, with less frequent boats during the night hours. 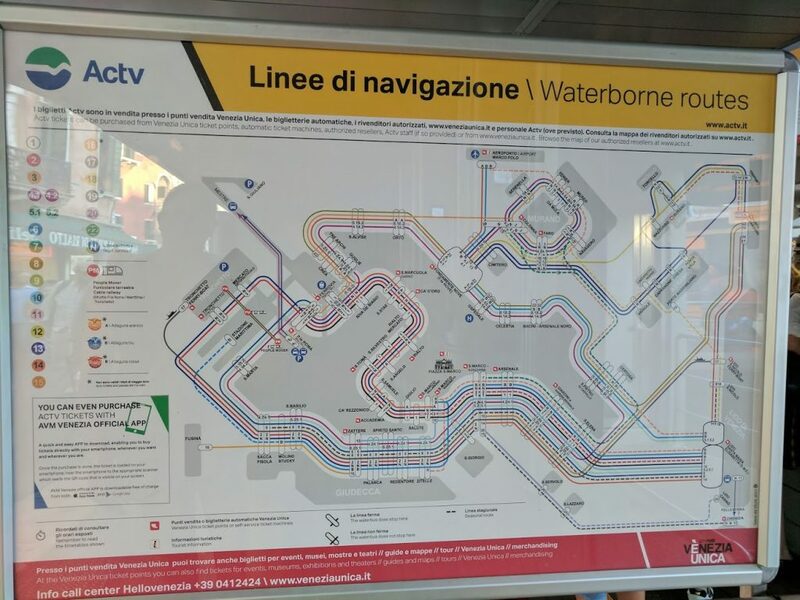 All that said, figuring out the Vaporetto bus stop map and times was one of the more confusing public transportation maps we’ve encountered. It’s definitely worth taking a few minutes ahead of time to help familiarize yourself with it. 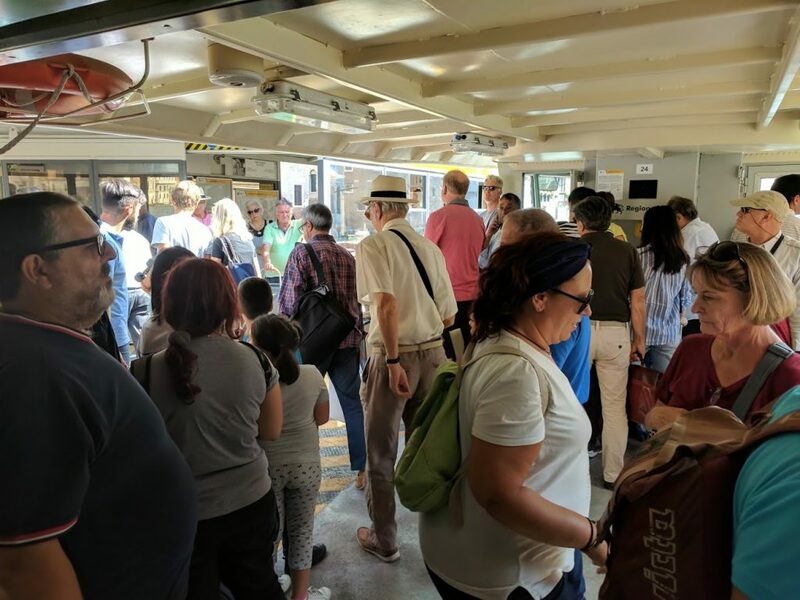 While you may want an express line boat that makes less stops and takes less time, jumping on a water bus that makes many stops around the island and takes much longer, is a very easy mistake to make. The tourist passes don’t activate until the first time you scan them, so you can buy one the night you arrive and then scan the next morning to activate. 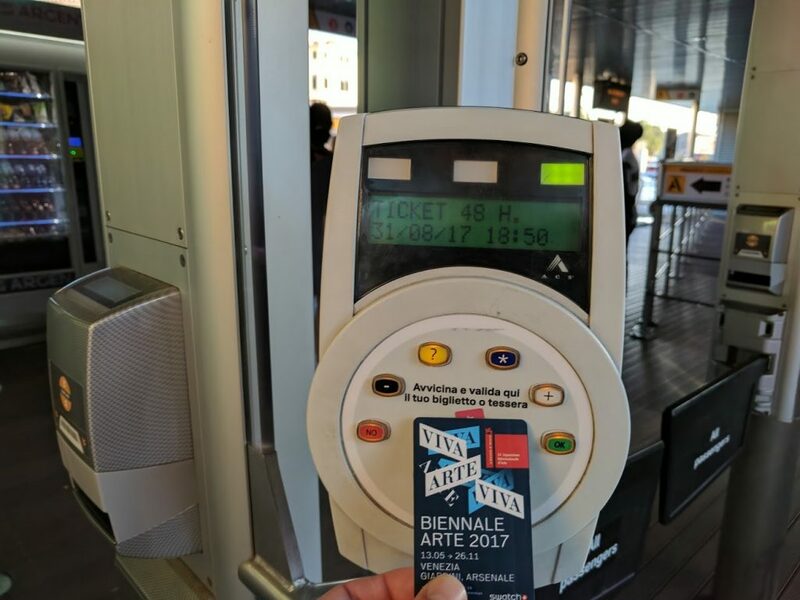 Tickets can be purchased at all stops (some stops have machines, some have real-live humans, and some have both). We were able to buy ours through our hotel for the same price, so it’s worth asking when you check-in. Okay, so now you’ve got a ticket, and you see a floating platform near your hotel, like we did from the Hotel Carlton. Larger stops have multiple platforms, so consult a posted map to be sure you enter the correct platform. One of the smartest things we did was taking a photo of the map with our phones, so we could consult the map without having to carry a big piece of paper or stand in front of this looking lost. The entire vaporetto system. Take a photo, like we did! At each platform’s queue, there will be a machine (see photo) to validate your card. You don’t just validate once, if you have a multi-day pass. You need to scan this every single time you get on the boat. Don’t forget to scan your ticket here, every single time you ride! Having used tons of public transportation in our travels, we actually were asked to provide proof of our ticket for the FIRST TIME EVER during a ride on the vaporetto. So, be warned: always validate your vaporetto ticket! The boat is also worth a ride simply because the views are incredible. 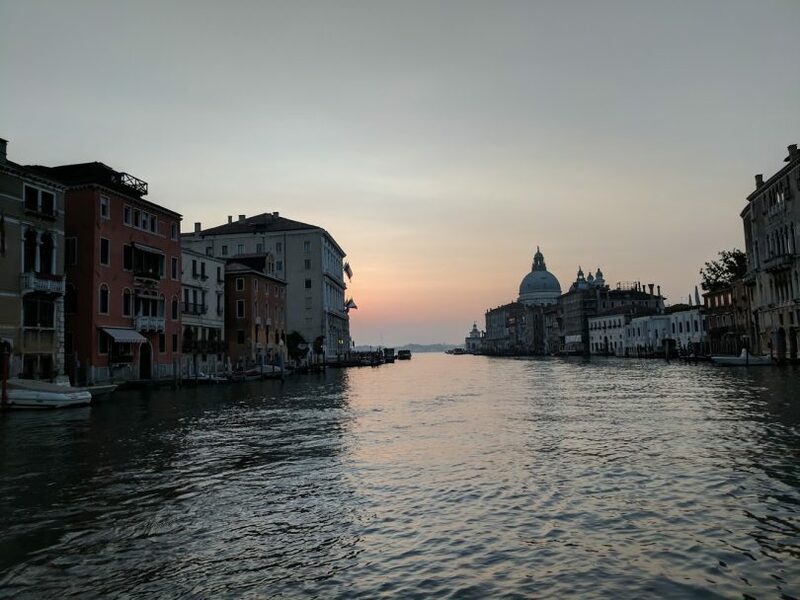 The vaporetto system runs to outlying islands like Lido and Murano (yep, you recognize that name because of their signature glass art) and goes through the entire Grand Canal. 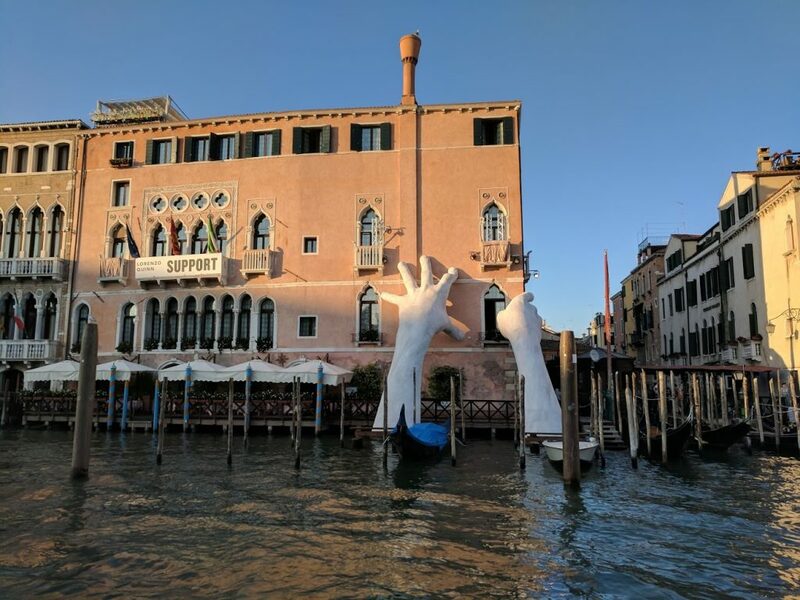 The vaporetto is a great way to see this famous sculpture, called “Support,” recently installed to highlight rising ocean levels due to climate change. 1: It’s kind of slow. Especially if you get on the wrong line. We accidentally boarded Line #1 and it took a full 45 minutes to get down the entire Grand Canal, and we ended up missing the sunrise we planned to photograph. 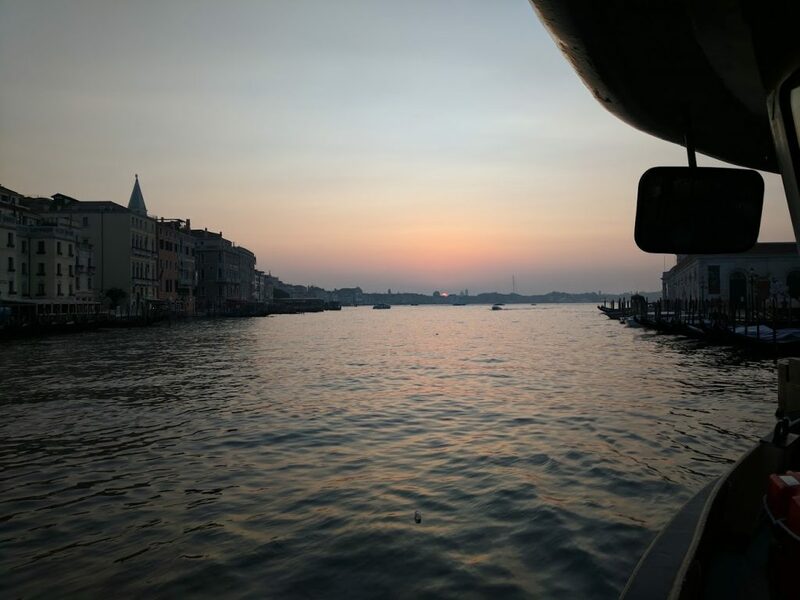 We still got an incredible view of the sunrise- but it was from the boat, instead of Piazza San Marco like we had originally planned. The sunrise from the boat. At least it was still beautiful! 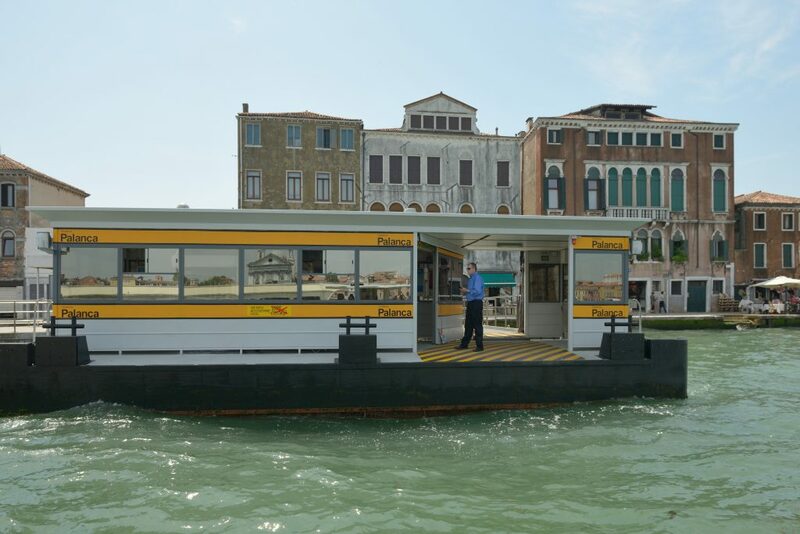 2: Everything in Venice is expensive, so it’s no surprise that riding the Vaporetto water bus is no different. It was €7 each ride when we visited. Locals and long-term visitors can buy a card that they add funds to and the fares cost much less- only €1.50 per ride. However, to get access to the card, you have to pay €50 to get started, so it’s not worth it to tourists who are only visiting Venice for a few days. This wasn’t bad at all, the crowds get much worse as the day goes on. 3: It gets quite crowded during peak hours and in popular locations. Many times we were packed in like sardines, and if you were to get sea-sick and need fresh air, you might be out of luck. 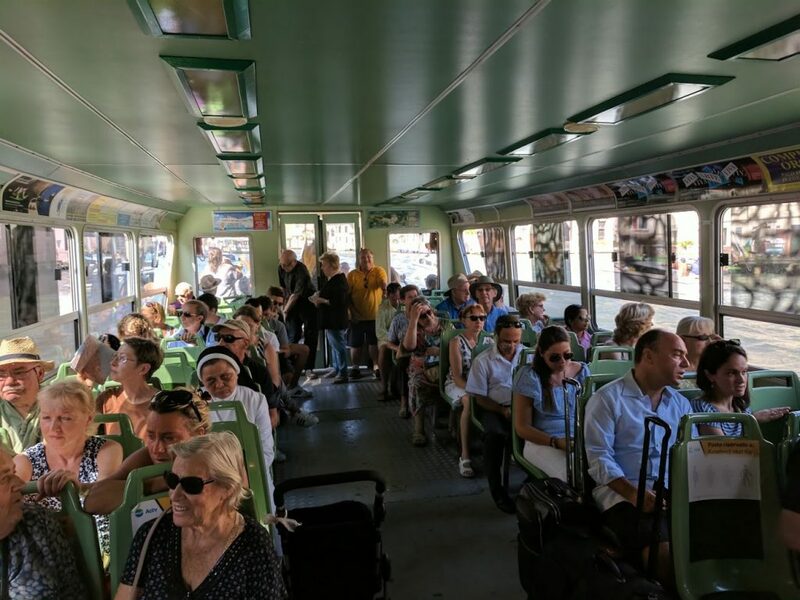 The Vaporetto crowds will get much heavier during mid-afternoon and especially if you are getting on or off at or near popular Venice spots, like the Piazza San Marco. Overall, we found this to be a really useful way to get around. While it had some downfalls, it also got us where we wanted to go, and gave us some amazing views in the process. 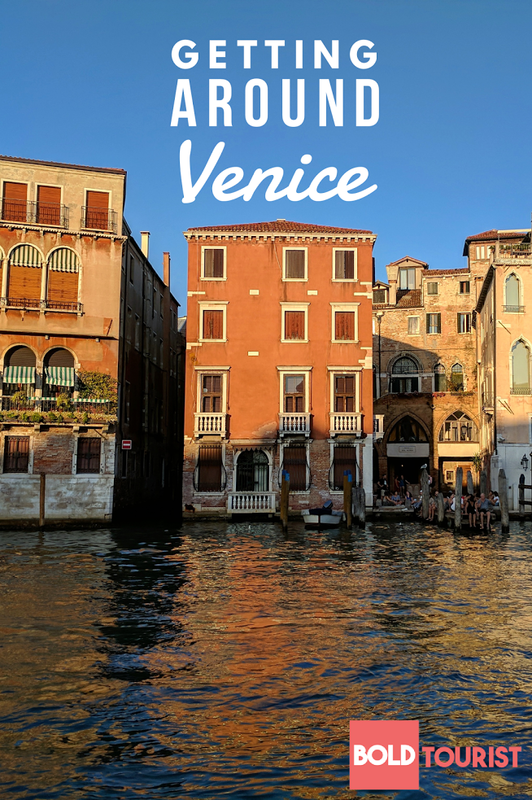 If you’ll be in Venice for a few days, it’s definitely worth snagging a tourist Vaporetto pass.